All text and Photographs are copyright protected. Copyright © 2007-2010 Kitchenmishmash.blogspot.com. All rights reserved. Please respect the fact that this is a humble attempt from my side to record some recipes, handed over to my family through grandmas & great-grandmas and also share some favourite dishes of my family, including the one I married into. All the content in this blog (text and photographs) are mine, unless noted otherwise. Copying, re-writing, republishing, redistributing or altering any text or photograph or part of the text, for any commercial or non-commercial purposes, without my written consent is strictly prohibited. Users with non-commercial purposes may link to the page or a specific post, but not allowed to reproduce or alter the content( text and photographs) without prior written permission. Please ASK first at shncjj@gmail.com. Kindly use comments section for any recipe clarifications and e-mails will not be entertained in this regard. Zaarga - a destination for the most beautiful home, lifestyle and fashion accessories by Indian Designers. Buy this 'Banana Leaf Bowl' by Tejas Soni at Zaarga. HandPicked collection of Authentic Indian Crafts! Last week I happened to read Ann’s evocative post, reminiscing her childhood days spent at maternal ancestral home and her story took me right back to my maternal home where I loved spending most of my childhood and adolescence. Nevertheless, what struck me most was the part where she painted the picture of her grandparents waiting for their arrival……….I knew exactly what she was talking about as that was more or less the same picture at my paternal ancestral home too. The only difference was that we didn’t have a grandmother waiting for us, instead Achichan/grandpa and a quarter dozen of my aunts and uncles and my little cousins waited for us. The smile on their faces and warmth in their eyes was always heart warming and inviting. My grandfather was a handsome old man, wheat complexioned with almost 6 foot height and a large round belly and a Rudraksha-maala/beaded chain around his neck and if it was his bath day, the gracefulness on his face doubled with that triple layer Chandana-kuri with a round kunguma – pottu on his forehead and some more chandanam/sandal paste smeared on his arms and chest, giving him an aristocrat regal look. When I look back, everything looks like from a totally different era altogether. That old house had been demolished and a new one is there in its place….Achichan passed away long back…… Shoola-thara has been removed and transported to our family temple…………….joint family has become single units though in the same yard itself…….when I called last weekend my little cousins are now all grown up and preparing for board exams and university exams but what still remains is that smile on their faces and warmth in their eyes and the table that continue to be the expression of love with the huge array of food presented each time we visit and the laughter in the house and gossip in the kitchen and ofcourse, Honey Bee in the motor shed too but I have been missing all that for last few years, like a typical NRI !!! Ann did stir up a tsunami of thoughts in my head! Kadachakka Puzhukku is a mushy preparation with overcooked breadfruit mixed with mildly spiced ground coconut mixture and my father recalls that it was a regular at home during the breadfruit season. It is usually served as a side dish for lunch but it is a tasty combo when served with Kanji, rice soup for dinner. 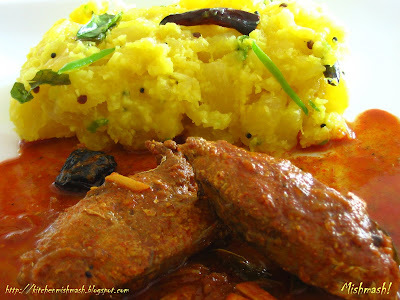 Though Puzhukku (mashed version) and thoran/stir-fry are technically two different things especially in terms of texture, the same ingredients and methods are used to make a dry stir-fry/thoran with kadachakka/breadfruit. For Puzhukku, it is ideal to have a slightly overcooked Kadachakka/Breadfruit to get a mushy texture for the dish whereas in Thoran, you should make sure that Kadachakka/Breadfruit is just cooked till tender, to have a dry stir-fry texture. 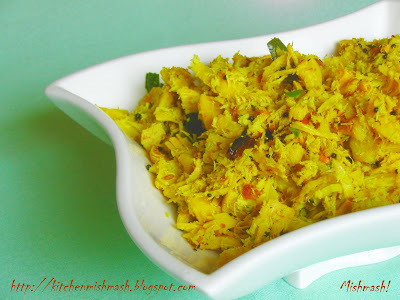 Cook cubed pieces of Kadachakka/Breadfruit with green chillies, turmeric powder, water and salt, on a stove top, in a sauce pan, until pieces are done and soft, in low-medium heat. To save time, you may also cook Kadachakka/Breadfruit in pressure cooker, until the first whistle comes. Then turn off the stove and let it rest till the steam subsides. Meanwhile, prepare the coconut mixture. Crush and blend the grated coconut well with finely chopped small onion, green chilies, turmeric powder, cumin seeds and a tinge of salt (do not add more salt here as you have already added while cooking Kadachakka/Breadfruit ), using your hands OR a mortar-pestle set OR put all the ingredients in a small food processor and pulse 1-2 times. Note: For Puzhukku, it is ideal to have a slightly overcooked Kadachakka/Breadfruit to get a mushy texture for the dish whereas in Thoran, you should make sure that Kadachakka/Breadfruit is just cooked till tender, to have a dry stir-fry texture. Check out Cynthia's post on Breadfruit with some brilliant shots. No part of the content ( articles, photographs, recipes) of this blog may be reproduced without my written permission.Copyright © 2007-2010 Kitchenmishmash.blogspot.com. All rights reserved. Thats one nostalgic post. I could relate to what is in the post. Never tried puzhukku with kadachakka. Waiting for the chakka to arrive in the market. ohhh shn!! that was too touching..almost made me cry!! even my parents tharavadu used to be so similar to wht u have written..but now nothing is left now!! i at times wonder wht childhood memories r v going to give to our future generation!! oh my god...u really made a painting for me with all those nostalgic words...reminded a bit about my childhood days...especially going for vacations to ancestral homes, swings, food, all cousins meeting up together.....dish looks yummy...will give it a try when i get kadachakka! 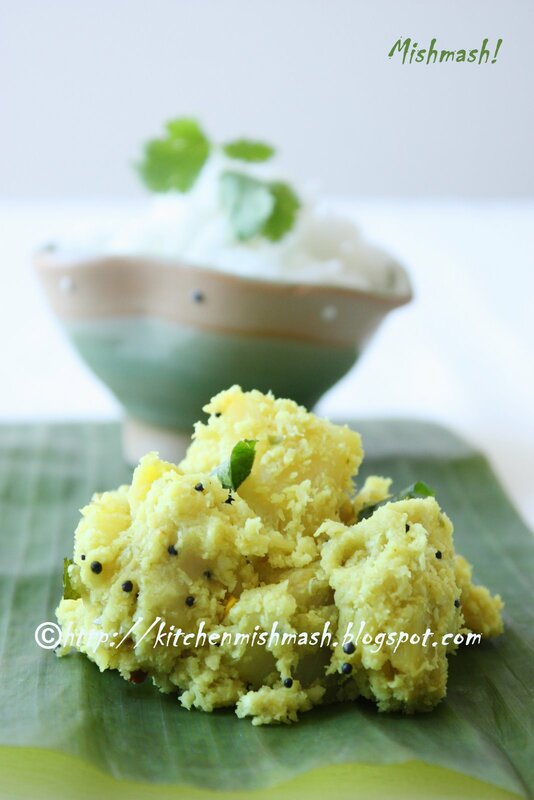 I love this puzhukku, mom used to serve sometimes with coconut chutney together with theis. Your story telling is just brilliant! My grandma used to prepare many dishes with kadachakka/bread fruit. Only last year I realized jack fruit/bread fruit/coconut etc not exclusive to Kerala( land of coconut). 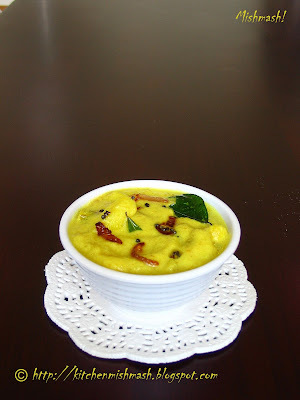 Actullay many Kerala dishes got origin from Jamaica/W.Indies, Hawaii and Thai land. kadachakka stew with boiled eggs. if you like I can give you recipes as well. The post was like watching Manichitrathazhu film !! That was such a beautiful peek into a Keralite home. How does Breadfruit look like, don't think I have ever had one. Reading this post I almost forgot the dish which was spread out coz i was put in a time machine just like I felt while reading Ann's post...I am just amazed how identical the memories are...esp the aprt with kozhikoodu and the parambu...For a kid who was brought up in the city going to the Parambu was an unique experience and i used to marvel at my cousins who used to be at ease with the climbing the trees and all..
chakka...hmm...i think its more than a decade since i had Kadachakka that I have almost forgotten the taste..I dont want to say more on it coz am still stuck somewhere in the parambu..this post is dripping in nostalgia!! adipoli..
the thoran looks soo inviting and reading your post made me soo very nostalgic.. wonder if we will get kadachakka here!! never tried anything by myself with that. Oh my gosh honey, I have definitely, I mean most-definitely got to try this. Yours looks awesome! Thanks for this! Divz, sorry :) yeah, thats exachtly how Ann also ended her post....it bothers me too...the responsibilty lies with us and the balance and decisions we make in life , to an extent , i guess! Ray, thx, but not interested! Jancy, Thanks! you re quite right about the kadachakka part....I heard my father saying it has its origins from W. Indies & Tahiti...and he also mentioned that it was earlier called kadal-chakka as it was imported via sea. Ofcourse, I would be privileged ifyou could share those recipes with me...I want everything except thoran and chips. I will surely try when i get some more kadachakka. Could you pls mail me at shncjj@gmail.com. ? Thx again! Alka, you sure can :) thx! Sandeepa, thx :) I have given a link at the end of the post...Cynthia's blog..she has got a couple of posts on the same. Superchef, thanks a lot :) You could try in some caribbean stores or frozen ones at the indian store itself. Cynthia, hope you enjoy this dish..i think u will like it :) Btw, will mail you soon. very thoughtful to put this post and I really loved reading it...recently I went to my ancestral (paternal side) home and all the good old memories just flashed by ...this is a beautiful sneak into a typical joint family...now the families have become nuclear and so sometimes we miss out those wonedrful times spent with cousins and uncles/aunts.. I think I have seen Cynthia's post on breadfruit , till then I thought Jack fruit and bread fruit are same , but they look very similar na? I simply adore your blog. In India I grew up next door to a family from Kerala. Vini Aunty did not speak Hindi very well and neither did my mother who is Iranian. They became the best of friends and developed their own language that other ladies in the neighborhood laughed at. They are still best friends after 18yrs. They both came from very beautiful places and they both missed home. They are both very wonderful and strong women. I would often (read: at least 5 times a week) eat at their house when I did not like what my mother cooked and aunty's kids did the same. Aunty had a passion for cooking which I have not seen in anyone else. She cooked with so much love and perfection. Her dishes were always accompanied by stories about her village in Kerala. I learned many important life skills from her including cooking. I had the good fortune of visiting her village two years back and I felt so very much at home. It felt like I had known the place forever. I knew all the Amommas,Valiammas, Valichans Chittas, Chettans and Chechis. Kerala and its people are so beautiful. Your nostalgic stories remind me of sitting in Aunty's kitchen and hearing stories about Kerala, her family, their superstitions and customs. I miss those days as I miss everything from my childhood. Thanks for refreshing my memory. By the way, I am taking my American husband to Vini Aunty's village for our belated honeymoon this year!!!! Ur post brought a forgotten link in our lives. Most of these comments have only one thing in common. That irrespective of the place they are in, all of them still remembers the one month vacation at their grandparents house. That attachment among cousins/aunts/uncles and undying love of our grandparents has kept this link still alive. Was just wondering will we able to pass on this love to the next generation. If we can do even a little it will make a lot of difference. I think this was ur best write up till date. Now ur post should add "Beware of Gurgling stomachs, Drooling mouths, appetising pictures with moist eyes and a heavy heart". I love your stories. In fact, I come here just as much to read your memories and relive my own, as to read your recipes and wish I was eating those dishes. Sigh! love puzhukku especially the chakka one.. reminds me of the thiruvathira day on dhanu masam..now that its really hard to get these stuff here we crave for it more..i thought breadfruit was called cheemachakka..guess i got it wrong..anyways gr8 recipe.thanks. Jaya, I wouldnt say similar....lets say they re cousins :) hmm...these days , it is hard to meet the entire family even if there is a marriage....! Jisha, oops! I really don't deserve that much :) Thanks so much ! Yeah you re absolutely right, everyone had only one thing to write about...their grandparents and the days spent with them....in our busy world, me too wonder how much we can give the next generation...but responsibilty lies with us, depends on the choices we make! 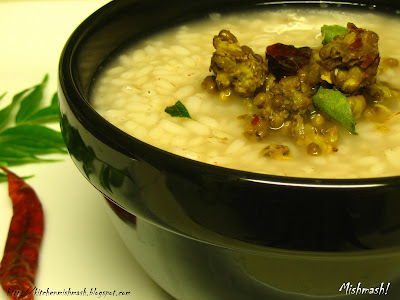 Malli, I have never had thiruvathira puzhukku....want to try that once...i am not sure but have a doubt that kadachakka and cheemachakka are the same..not sure though! Mishmash! - One who flew into Cuckoo's Nest !! 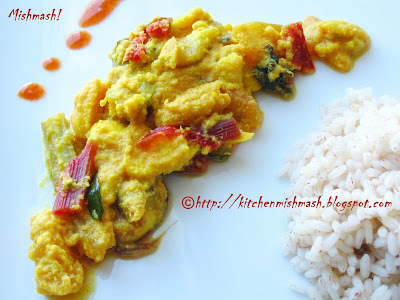 SADYA VIBHAVANGAL - Learn to make the traditional Kerala Feast- An Artist’s Edible Palette !